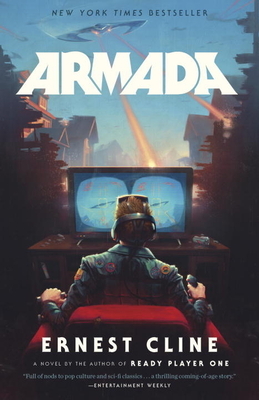 Author Ernest Cline has followed up his much-loved Ready Player One with another celebration of video game history called Armada. Young Zack Lightman (Cline has a penchant for naming his main characters as if they were from a comic book) has never met his father. In an effort to get to know the man, Zack has adopted his father’s love for nostalgic video games and pores over an old notebook filled with his father’s crazy conspiracy theories. What Zack soon finds out is that his father was closer to the truth than anyone thought. Armada moves away from the dystopian future of Ready Player One and is steeped in conspiracy theories, alien invasions, and tons of action. Strap yourselves in for a trip filled with video games, paranoia, and interstellar conflict. From the author of Ready Player One, a rollicking alien invasion thriller that embraces and subverts science-fiction conventions as only Ernest Cline can. Zack Lightman has never much cared for reality. He vastly prefers the countless science-fiction movies, books, and videogames he's spent his life consuming. And too often, he catches himself wishing that some fantastic, impossible, world-altering event could arrive to whisk him off on a grand spacefaring adventure. So when he sees the flying saucer, he's sure his years of escapism have finally tipped over into madness. Especially because the alien ship he's staring at is straight out of his favorite videogame, a flight simulator callled Armada--in which gamers just happen to be protecting Earth from alien invaders. As impossible as it seems, what Zack's seeing is all too real. And it's just the first in a blur of revlations that will force him to question everything he thought he knew about Earth's history, its future, even his own life--and to play the hero for real, with humanity's life in the balance. But even through the terror and exhilaration, he can't help thinking: Doesn't something about this scenario feel a little bit like...well...fiction? At once reinventing and paying homage to science-fiction classics, Armada is a rollicking, surprising thriller, a coming-of-age adventure, and an alien invasion tale like nothing you've ever read before. ERNEST CLINE is an internationally best-selling novelist, screenwriter, father, and full-time geek. He is the author of the novels Ready Player One and Armada and co-screenwriter of the film adaptation of Ready Player One, directed by Steven Spielberg. His books have been published in over fifty countries and have spent more than 100 weeks on The New York Times Best Sellers list. He lives in Austin, Texas, with his family, a time-traveling DeLorean, and a large collection of classic video games. "Hugely entertaining…a paean to the videogames of a bygone era, and like Ready Player One it is a tremendous amount of fun for anyone who remembers that time and played those games." "A novel so fun, you'll want to reboot it and read it again…the best novel this gamer geek has read in a long, long time." "Those conspiracies you imagined when you were fourteen turn out to be true in this masterful tale of Earth's desperate struggle against a powerful alien foe." "Armada proves Ernie Cline is the modern master of wish fulfillment literature - and of reminding us to be careful what we wish for." “Ridiculously fun and large-hearted… Cline is that rare writer who can translate his own dorky enthusiasms into prose that's both hilarious and compassionate. You'll wish you could make it go on and on."